Martin Rodbell (December 1, 1925 – December 7, 1998) was an American biochemist and molecular endocrinologist who is best known for his discovery of G-proteins. He shared the 1994 Nobel Prize in Physiology or Medicine with Alfred G. Gilman for "their discovery of G-proteins and the role of these proteins in signal transduction in cells." 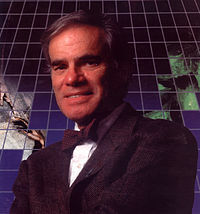 According to a Plaque posted in Silver Spring Maryland, Dr. Martin Rodbell was a "Nobel Laureate in medicine for discovering that cells were like computer chips." Rodbell was born in Baltimore, Maryland, the son of Shirley (née Abrams) and Milton Rodbell, a grocer. His family was Jewish. After graduating from the Baltimore City College high school, he entered Johns Hopkins University in 1943, with interests in biology and French existential literature. In 1944, his studies were interrupted by his military service as a U.S. Navy radio operator during World War II. He returned to Hopkins in 1946 and received his B.S. in biology in 1949. In 1950, he married Barbara Charlotte Ledermann, a former friend of the legendary diarist Anne Frank, with whom he had four children. Rodbell received his Ph.D. in biochemistry at the University of Washington in 1954. He did post-doctoral work at the University of Illinois at Urbana-Champaign from 1954 to 1956. In 1956, Rodbell accepted a position as a research biochemist at the National Heart Institute, part of the National Institutes of Health, in Bethesda, Maryland. In 1985, Rodbell became Scientific Director of the NIH's National Institute of Environmental Health Sciences in Research Triangle Park, North Carolina where he worked until his retirement in 1994. He was also Adjunct Professor of Cell Biology at Duke University (from 1991 to 1998) and Adjunct Professor of Pharmacology at the University of North Carolina at Chapel Hill. He died in Chapel Hill of multiple organ failure after an extended illness. Reflecting the increasingly common analogies between computer science and biology in the 1960s, Rodbell believed that the fundamental information processing systems of both computers and biological organisms were similar. He asserted that individual cells were analogous to cybernetic systems made up of three distinct molecular components: discriminators, transducers, and amplifiers (otherwise known as effectors). The discriminator, or cell receptor, receives information from outside the cell; a cell transducer processes this information across the cell membrane; and the amplifier intensifies these signals to initiate reactions within the cell or to transmit information to other cells. In December 1969 and early January 1970, Rodbell was working with a laboratory team that studied the effect of the hormone glucagon on a rat liver membrane receptor—the cellular discriminator that receives outside signals. Rodbell discovered that ATP (adenosine triphosphate) could reverse the binding action of glucagon to the cell receptor and thus dissociate the glucagon from the cell altogether. He then noted that traces of GTP (guanosine triphosphate) could reverse the binding process almost one thousand times faster than ATP. Rodbell deduced that GTP was probably the active biological factor in dissociating glucagon from the cell's receptor, and that GTP had been present as an impurity in his earlier experiments with ATP. This GTP, he found, stimulated the activity in the guanine nucleotide protein (later called the G-protein), which, in turn, produced profound metabolic effects in the cell. This activation of the G-protein, Rodbell postulated, was the "second messenger" process that Earl W. Sutherland had theorized. In the language of signal transduction, the G-protein, activated by GTP, was the principal component of the transducer, which was the crucial link between the discriminator and the amplifier. Later, Rodbell postulated, and then provided evidence for, additional G-proteins at the cell receptor that could inhibit and activate transduction, often at the same time. In other words, cellular receptors were sophisticated enough to have several different processes going on simultaneously. Life on a roller coaster, oscillating from hither to yon, no respite for the iconoclast, wandering from dusk to dawn. Conjuring strange thoughts foreign and twice forbidden, like Prometheus unbound, this Nobelist climbs in vain to Andean peaks, seeking what most would proclaim insane. Why, he ponders, are there no answers to protean questions when others thinking cleanly and simply with Occam’s sharp razor proclaim what seems obvious given the beam of their unerring laser. Nature, happily unfettered with philosophy, or with cunning, or with intent moves relentlessly onward or even backward with energy unspent while we mortals test and probe with twinkling machines blinking precisely at each movement, striving to unravel its irresolute randomness, its fathomless, unlimited, meaningless rush into spiraling chaos, oblivious of its multitudinous trials & errors which we pontifically believe must be unerring truth & resolution. The laugh is on those who, burdened with pretensions of truth, believe they can fathom within 15 minutes of human existence what has transpired over eons of space and time in this Universe . So, I extol the intuitions encapsulated in the folds of my mind from whence occasionally they hurtle to the forebrain and in a twinkling of a proton’s discharge bring to fruition a thought, an idea borne on the feathery appendages of teeming neurons wedded in a seamless synergy. Those fleeting moments are cherished as are those precious impulses imparted by the innumerable individuals who nurtured and instilled unknowingly their encrypted thoughts in mine. So, with these fanciful thoughts in mind I give praise to you - my friends, my colleagues, my soul-mates, my loved ones - for letting my soul and thoughts meander hither and yonder in this attempt at philosophy and poetry. We now belong to the Gods on high who praise us for our frailties and our achievements. ^ "Martin Rodbell - Biographical". nobelprize.org. Retrieved 2015-05-15. ^ Betz, P.R. ; Carnes, M.C. ; American Council of Learned Societies (2005). American National Biography: Supplement 2. Oxford University Press, USA. p. 478. ISBN 9780195222029. Retrieved 2015-05-15. ^ "alumni/columns/june96/rodbell2". washington.edu. Retrieved 2015-05-15. ^ "Nobel Laureate Martin Rodbell Dies". Environmental Health Perspectives. 107 (1): A9. January 1999. doi:10.1289/ehp.99107a9. PMC 1566302. PMID 9872722. ^ Barnes, Bart (December 11, 1998). "Nobel Winner Martin Rodbell Dies". The Washington Post. Retrieved 31 December 2015. Raju, T N (June 2000). "The Nobel chronicles. 1994: Alfred G Gilman (b 1941) and Martin Rodbell (1925-98)". Lancet. England. 355 (9222): 2259. doi:10.1016/s0140-6736(05)72762-8. ISSN 0140-6736. PMID 10881927. Birnbaumer, L (March 1999). "Martin Rodbell (1925-1998)". Science. United States. 283 (5408): 1656. doi:10.1126/science.283.5408.1656. PMID 10189319. Svoboda, P (June 1995). "[The Nobel Prize for physiology and medicine 1994. Alfred G. Gilman and Martin Rodbell--the role of GTP-binding proteins in signal transfer in the interior of cells]". Cas. Lek. Cesk. Czech Republic. 134 (13): 415–7. ISSN 0008-7335. PMID 7671286. Schultz, G (March 1995). "Nobel Prize 1994 for medicine/physiology". J. Mol. Med. Germany. 73 (3): 121–2. doi:10.1007/BF00198239. PMID 7633948. Kurlandzka, A; Fronk J (1995). "[Nobel prize 1994 -- G proteins]". Postepy Biochem. Poland. 41 (1): 3–4. ISSN 0032-5422. PMID 7777431. Bogucki, W M (1995). "[Nobel prize in physiology and medicine in the year 1994]". Pneumonologia i Alergologia Polska. Poland. 63 (1–2): 120–2. ISSN 0867-7077. PMID 7633362. Flawia, M M (1995). "[Nobel Prize in medicine 1994: Martín Rodbell and Alfred Gilman. Signal transduction]". Medicina (B Aires). Argentina. 55 (1): 75–80. ISSN 0025-7680. PMID 7565041. Blum, H E (December 1994). "[The Nobel Prize for Medicine 1994]". Dtsch. Med. Wochenschr. Germany. 119 (51–52): 1792–5. doi:10.1055/s-0029-1235137. ISSN 0012-0472. PMID 7736935. Farfel, Z (December 1994). "[Nobel Prize winners in Medicine 1994]". Harefuah. Israel. 127 (12): 530–1. ISSN 0017-7768. PMID 7813930. Fredholm, B B; Aperia A (December 1994). "[The 1994 Nobel Prize: discovery and significance of G-proteins]". Ugeskrift for Læger. Denmark. 156 (50): 7520–4. ISSN 0041-5782. PMID 7839516. Christoffersen, T (December 1994). "[The 1994 Nobel Prize in physiology and medicine. Signal transduction and g-proteins]". Tidsskr. Nor. Laegeforen. Norway. 114 (30): 3562–3. ISSN 0029-2001. PMID 7825126. Lefkowitz, R J (December 1994). "Rodbell and Gilman win 1994 Nobel Prize for Physiology and Medicine". Trends Pharmacol. Sci. England. 15 (12): 442–4. doi:10.1016/0165-6147(94)90053-1. PMID 7886813. Krans, H M (November 1994). "[The 1994 Nobel Prize for Medicine for the discovery of G-protein]". Nederlands tijdschrift voor geneeskunde. Netherlands. 138 (48): 2380–2. ISSN 0028-2162. PMID 7990983. Marx, J (October 1994). "Nobel Prizes. Medicine: a signal award for discovering G proteins". Science. United States. 266 (5184): 368–9. doi:10.1126/science.7939678. PMID 7939678. Fredholm, B B; Aperia A (October 1994). "[Nature's solution of the communication problem resulted in Nobel Prize. Significance of G-proteins for signal transmission in cells]". Lakartidningen. Sweden. 91 (42): 3811–7. ISSN 0023-7205. PMID 7996951. Coles, H (October 1994). "Nobel honours pursuit of G proteins". Nature. England. 371 (6498): 547. doi:10.1038/371547b0. PMID 7935774. Lakso, M; Wong G (1994). "[Nobel Prize to a supporter of young scientists]". Duodecim; lääketieteellinen aikakauskirja. Finland. 110 (23–24): 2184–6. ISSN 0012-7183. PMID 8654237. Rodbell, M (December 1991). "The beginnings of an endocrinologist". Endocrinology. United States. 129 (6): 2807–8. doi:10.1210/endo-129-6-2807. ISSN 0013-7227. PMID 1954866. This page was last edited on 2 August 2018, at 21:27 (UTC).